In almost 40 years of painting nearly 200 murals throughout the region, Rick Rupp found a new challenge in Russell, KS! 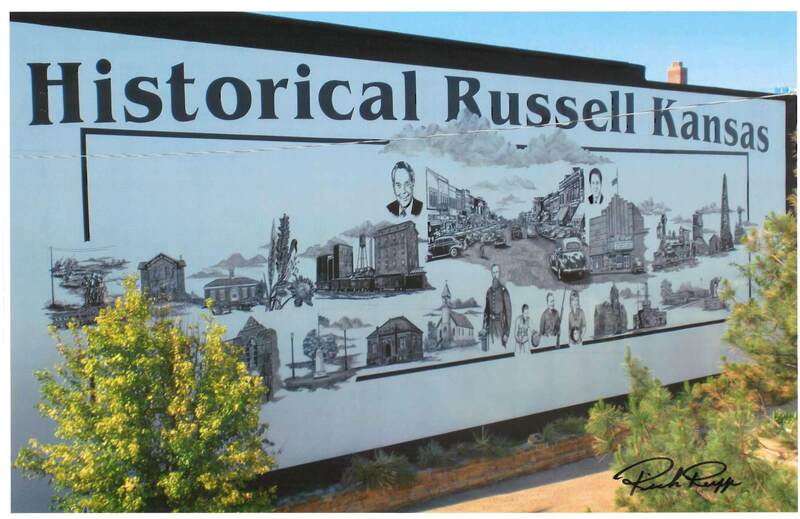 This mural of Russell History can be seen on a 30x100 foot black and white mural on the south side of a building on the corner of 8th and Main. This GIANT mural depicts people and places dating back to the 1870s to today. There are as many as 35 images on the mural that tell the story of Russell, KS. Come take a peak and learn the history of this UNIQUE town! Anyone visiting downtown Russell can now view Russell's History for many years to come!